I'd like to introduce you to Lisa from Two Bears Farm as we celebrate friendships this month with Friends You Love! 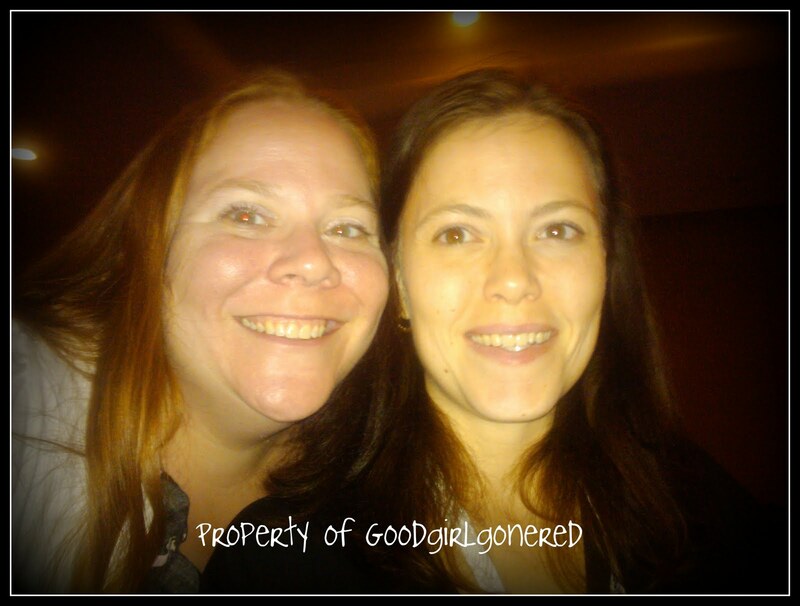 I had the pleasure of finally meeting Lisa IRL this summer when we attended TypeAParent Conference. She was my roomie for the weekend, and she made me some delicious sweet treats (seriously, go check out her recipes. She's amazing with natural foods. I do not lie!). Isn't she just too cute? Anyway, please go on and read a story from Lisa in only the way she can write one. You'll find yourself touched and moved. And please let her know that! I am so honored that Andrea invited me back a second year to post during Friends You Love week. I’ve been following Good Girl Gone Redneck for at least a year and a half now, and always look forward to Andrea’s warm and heartfelt posts. I got the chance to meet her in real life this summer during Type A Con, and had so much fun chatting about life as a mom, books, and PPD. She’s just as easy to talk to in real life as she is online. Thanks, Andrea, for inviting me back, and for being a great friend to me! Since this month is all about friendship, I started thinking about the first time a friendship of mine hit an adult note. Do you remember the first time your friendships left the carefree days of youth and reached a different, more mature level? It happened at the tender age of 14 for me. My best friend, K.D., had spent long, leisurely summer days with me. We’d ridden horses, had sleepovers, gone shopping, and eaten our fill from the brand new fast food chain, Taco Bell. It was a summer of innocence, but then K.D. and I went to separate schools, and only saw each other for riding lessons. K.D. fell into a bad crowd. I still don’t know all the details of what happened, but one day my mom pulled me into the room and told me to sit down. Then, she gingerly broke the news that K.D. was in a mental hospital. A mental hospital? My summer best friend -- my larger than life, bubbly, beautiful and creative friend -- K.D.? Yes. K.D.’s mom had called mine, and said that she was asking for me to call her and to write to her. The letters I got broke my heart and shocked me. K.D. had changed. She wrote about her 19 year old boyfriend, who was in jail, and how she wanted to have his baby (this, during a time when having babies was definitely not something you saw in high school). She wrote long, heartfelt letters about how her best friend in the hospital went crazy one night, about how she had to watch her tackled by nurses, and held down while they doped her, and eventually put her into a straightjacket. I wanted to fix things for K.D. I wanted to take away her pain, to get her out of that dark place and offer her hugs and somehow magically erase time until we went back to our warm summer days. But I learned that sometimes, in friendship, the way you can help most is to listen. You can’t always change and fix. And you can never erase time. But you can support by calling and writing, by standing by someone when they fall. K.D. did get out of the hospital, and they placed her in a different school. It took her a while to get her life back on track, but eventually she did, and she was able to go to college and enter a successful field in the medical profession. And all these years I never forgot that sometimes, to hold your friends up, you just need to open your ears. Nice to meet you Andrea. Lisa, this was heartbreaking but with such a happy ending. You wrote it beautifully, as always. Listening. Yup. Most important in any relationship. Thanks for your post! I think that's so true. People just want to be heard and know you care sometimes--no matter what age. You were a good friend. I'm glad K.D. was able to get her life back on track. What a tought time she went through! I am so glad she had you as a friend. This post really got me thinking Lisa. I can only imagine how hard this transition from childhood to hard reality was on both you and KD. I'm so happy to hear that she's doing okay. Life can be such a tricky thing sometimes. Beautiful post my friend. A touching and beautiful post Lisa:) Sometimes holding a friend up may be the difference between life and death-and just listening, while it may not seem like much, is the only thing someone really wants anyone to do. nicely done, lisa - both then and now. :) hi andrea! Not everyone has the gift of listening, but I'm glad you do and that you were there to support her when she most needed it. A good reminder for us, Lisa. I've heard the same said by those grieving that the best thing a friend can do is come alongside and listen. Hopefully we are all lucky enough to have someone to share these moments with. I think sometimes we don't know how rare our friends are until we get older. This is a story of true friendship! two beautiful girls, one story of amazing friendship!! lisa and i are new friends, mail swap friends. thanks to jill we found each other. and p.s....i think jersey has the best pizza!! Oh sweetie, good friends are truly our treasures here on earth. You two are just too darn stinkin' cute. Not everyone has the ability to be a good listener. Beautiful post today, I truly enjoyed it. Beautifully said! It's not always easy to JUST listen, but we so often need to do just that! Very great post! And yes sometimes it needs a good friend who can listen well. Very nice to meet you Andrea! and yes she makes WONDERFUL treats!! What a sweet post...yes, sometimes our friends simply need a listening ear and a shoulder to lean on. I'm sure your friend will always remember you being there for her! Nice to meet you, Andrea! I came over from Lisa's blog!